Our comrades from Antiauthoritarian Movement are co-organizing together with the initiative Mesochora-Acheloos SOS from the 20-22 July a political camping in Mesochora. Since years local citizens together with activist from other cities in Greece are resisting against an infrastructure project, the diversion of the river Achelooos. Feel free to mobilize and participate in the camping which will include meetings with the locals, discussions about eco-social struggles and actions. For more information please contact mesochora.acheloos.sos@gmail.com. The diversion of the waters of the Acheloos River is the largest water planning project in Greece. Acheloos, also known as Aspropotamos, whose tributaries are located in the Pindus mountain range, is the second longest river in the country, and on it, three large hydroelectric dams with major impacts on the ecosystem have already been constructed, since the 1960s. The diversion of Acheloos’ waters to the neighboring district of Thessaly was designed on the principle of unlimited and unchecked capitalist “growth”, and it has been a bi-partisan project: The political system of the country, the current government and the former governments, the state electricity company (ΔΕΗ) and other energy companies, all view the Acheloos River and the surrounding forests, the mountains, as well as the sea and all natural resources, as their own private property that they can sell and buy to increase their profits and power. Although this diversion project was cancelled six times in courts, although it was refused funding by European funds and despite the strong reaction of the local society and the ecological organizations, the current government, against its pre-election promises, continues the project, partly through the segmentation method. On August 2017, the country’s ministry of environment signed a permit to operate the giant 150-meter-high dam, built on the upper reaches of the river, next to the Mesochora village that faces the danger of extinction if the dam operates. This authorization was granted on the pretext of the production of hydroelectric power, despite the fact that the dam’s estimated contribution to the country’s energy reserves would be miniscule, and that large hydroelectric dams worldwide are not considered as Renewable Energy Sources (RES). This permit is an appetizer for those who support the diversion of the river towards Thessaly, since only a few kilometers below, at Sykia, another hydroelectric dam, which is part of the diversion project, has been built but has not been put into operation yet. For at least 30 years, the residents of Mesochora resist the destruction of their village and environment, and from 2007 to 2010, a dynamic ecological movement emerged all over Greece, against the plunder of the remaining water of Acheloos, proposing the social ecological management of water as an inalienable natural common good. Three campsites were organized on the banks of the river, near Mesochora and respective demonstrations have been held on the crest of the dam. From 2017 the Mesochora residents and citizens from all over Greece created the Mesochora-Acheloos SOS Initiative to strongly express their opposition to the operation of the Mesochora dam and the diversion of the river. In this context, given the ecological impacts of the operation of major dams, and the desolation evident on the river banks and stream, we demand the definitive cancellation of the project and the demolition of the dam. The issue of water and energy management is a profoundly social issue – it cannot be left to the arbitrary plans of governments that treat their citizens as simply voters, neither to the appetites of energy companies which are only interested in increasing their profits. 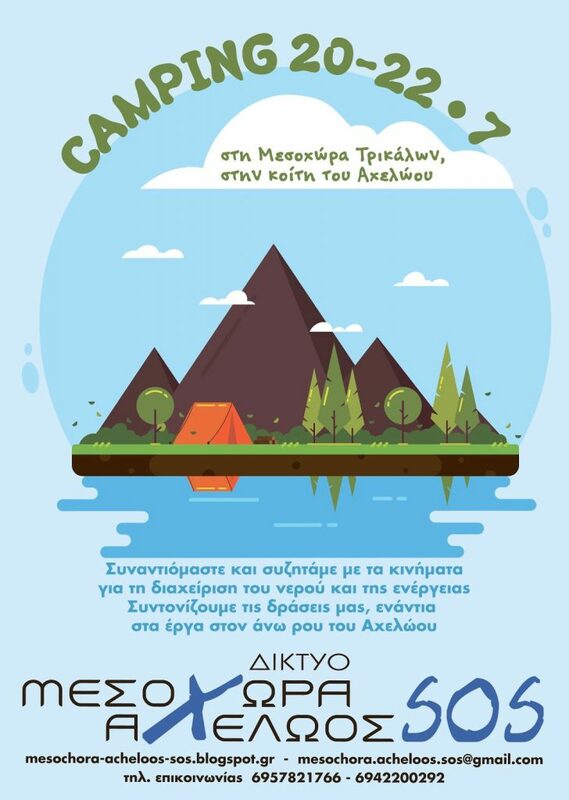 In order to protest for the definitive cancellation of the plan and the salvation of Mesochora, the Mesohora-Acheloos SOS Initiative invites everyone to a three-day free camp on the river banks, in Mesochora from 20 to 22 July 2018, which will include open assemblies, discussions, screenings, and cultural events.